405 pages | 35 B/W Illus. The supplement market continues to grow annually with more than half of the population using these products for reasons spanning from health maintenance to disease prevention and/or treatment. Dietary Supplements in Health Promotion presents clear and concise evidence on how dietary supplements may contribute to maintaining health status. The book provides information on personalized nutrition, nutrient gaps, and postulated benefits of various mainstream dietary supplements such as multivitamins, probiotics, and flavonoids, among others. With so many opinions and misinformation on the risks and benfits of using dietary supplements, an authoritative book is necessary to advance the accurate knowledge and dissemination of research relating to the many effects of prescribing or utilizing dietary supplements. 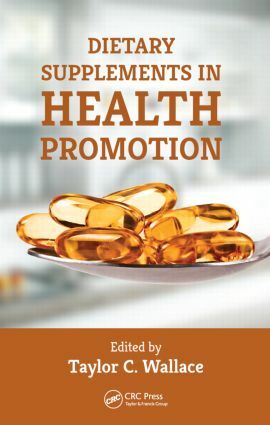 A balanced review of popular dietary supplement products and their effects on human health, this book gives you practical advice on the appropriate use of dietary supplements, including clinical guidelines on recommendations of supplements, and just as important, when to discourage use of supplements. Taylor C. Wallace, PhD, CFS, FACN, is an Affiliate Professor in the Department of Nutrition and Health Studies at George Mason University. He also serves as the Senior Director, Science Policy and Government Relations at the National Osteoporosis Foundation (NOF) and the Senior Director, Scientific and Clinical Programs at the National Bone Health Alliance (NBHA), a public-private partnership, managed and operated by the NOF. His academic research interests are in the area of nutritional interventions (micronutrient and dietary bioactive components) to promote health and prevent the onset of chronic disease. He also teaches NUTR 430 Wine and Beer and NUTR 611 Food Nutrition Policy. Previously, Dr. Wallace’s background includes a PhD and an MS in Food Science and Nutrition from The Ohio State University and a BS in Food Science and Technology from the University of Kentucky. In his free time, Dr. Wallace manages and operates a large food and nutrition blog, DrTaylorWallace.com, where he provides science-based nutrition, food safety, and food technology information to the general public and consumer media. Dr. Wallace has served as a past Trustee and Treasurer of Feeding Tomorrow, the Foundation of the Institute of Food Technologists and is a fellow of the American College of Nutrition. Dr. Wallace is the editor or co-editor of four academic textbooks and has authored over 30-peer reviewed original research manuscripts, reviews, book chapters and commentaries.